Perforated Sheet, available in several different metals, is often used for decorative or filter purposes. Its perforations allow light, air, liquid and sound to pass through its openings. Having a large assortment of hold openings and spacing allow for a wide selection of sizes to fit your particular application. Aluminum Perforated Sheet is punched with perforations in different sizes and shapes. It is lightweight and corrosion resistant. It is easy to weld, cut, and form with the right equipment. Light, air, liquid and sound are able to pass through its openings. It is available in standard and custom sizes. Shop for Aluminum Perforated Sheet Online! Stainless Perforated Sheet is very corrosive resistant and lightweight. It has a mill, not shiny, finish. It is available with punches in a range of sizes and shapes. Often used for decorative or filter purposes, it allows light, air, liquid and sound to pass through its openings. It is available in standard and custom sizes. 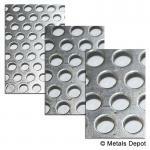 Shop for Stainless Perforated Sheet Online! 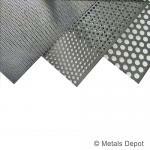 Shop for Steel Perforated Sheet Online!